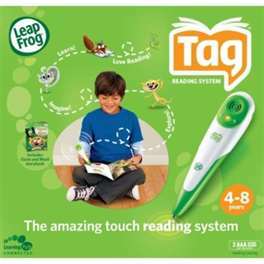 This Leap Frog product has been a major factor in the reading growth of my 5 year old. He struggled with the simplest words, despite being able to write well. The Tag Reader has enable him to spend time going over and over words until they stuck. The wand made it quite fun for him. I purchased this for my son while he was in Kindergarten so he was in the beginning stages of reading. He used it for a few months maybe 4 or 5 and then he stopped using it. He became more determined to sound the words out his self. This is a great product. I even purchased it for my two nieces for Christmas. They love it too! My son uses this pen all the time. It really helped him learn to read and gave him the ability to interact so that he could comprehend what he was reading. Invaluable educational learning tool and toy. Only wish they would put out more books. we like this for prereaders. once they know how to read evena few words it didnt work for us. the games books are still played with. My daughter loves her Tag reader! It is great for kids starting to read. They have interactive games and questions and helps with pronunciation for words kids don't know. They only down side is it can only hold so many books in the memory. I wish they could add extra storage space on it. I would definitely recommend this to any parent!! !